High quality organic potting soil. Lemon verbena is a tender perennial; its roots should not be allowed to freeze. In most climates, it is best grown in a container that can be kept in a cool (but not freezing) place through winter, the plant’s dormant season. Fertilize with an organic water soluble fertilizer every two weeks from spring to fall, when the plant is actively growing in a container. Feeding is not generally needed for plants grown in beds in semi-tropical climates. Monarda. Use this 3-foot (90 cm) tall herb as a movable accent in your summer herb garden. Start with a purchased plant, or obtain a stem tip cutting from a friend and root it in late spring. Cuttings and divisions are best taken when plants are emerging from dormancy in late spring. Lemon verbena is typically grown as a specimen plant in a container at least 12in (30 cm) in diameter. A mature plant, grown in a sunken container, will occupy a space 18in (45 cm) square if well staked but still expect lanky growth that responds well to monthly trimming. 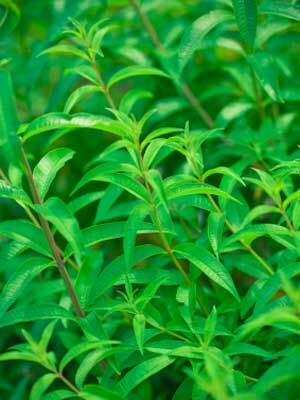 Lemon verbena is the most "lemony" of all lemon foliage herbs. Locate it where leaves can be conveniently picked, crushed and sniffed. Gather sprigs as desired. Smelling lemon verbena is a special delight of summer best captured in teas. Dry perfect leaves in small bunches, and store them in airtight containers. This is a fragrance herb to delight your sense of smell. Incorporate stems in flower arrangements scent the air with lemon. Put a piece in your pocket. Repot plants in spring, gradually moving to slightly larger pots. In summer, sink the pot into the ground to protect it from overheating and drying out on hot days.